I’ve never like having anything on my head while running or working out; actually this was big issue when I was serving in the SEABEES. When things got hot it would tend to remove my cover which is frowned on while on bases on US Soil. Since I have been running long distances the amount of perspiration from my head has increased, it seems, ten fold. This perspiration tends to be really, I mean REALLY, salty and when it decides to run into my eyes the salt burns so much that its hard to see though my active blinking and rubbing. It’s really not so bad when I’m running most times the cool air and San Diego beach breeze keeps the majority at bay; its when its hot, still, and humid or I have to stop for whatever reason and the sweat glands go into overdrive it gets hard to control. Wicking it away using my fingers is my normal process for keeping it from rolling into my eyes; I’ve not yet achieved running speeds that would cause the beads of sweat to peal off my face such as the rain does on a cars windshield. So I’ve been considering wearing something, something I hope that doesn’t make me look like and 80’s version of Oliva Newton-John. 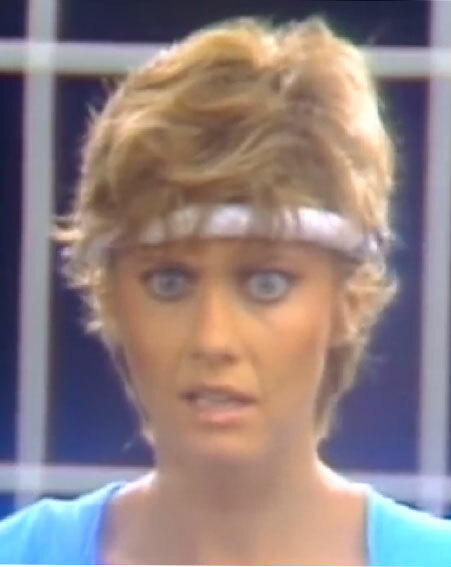 What ‘IT’ is i’m not sure yet; Has anyone invented invisaband sweatband yet? This entry was posted in Running and tagged perspiration, run, running, sweat, sweatband. Bookmark the permalink. What about a buff? Lots of options for head coverage! How about wristbands? You can wipe down your face easier and not have head coverage. I have used wrist bands and they work well for me. Plus they’re cheap 😃 so it’s an affordable experiment to see if they work for you. When I have worn them I just wear one wristband and I wear it on the wrist opposite to my watch. What are wrist bands actually for anyhow? Do they keep the sweat on your arms from running down on your hands? Exactly. Used to use them when I played tennis. I have the same problems with sweat as you; burning eyes, etc. I use Halo bands because they have a rubber gutter that pushes the sweat off to the side of your face. There’s no escaping how dated they look despite how well they work. Halo, I think I have seen those at dicks sporting goods, they are thin right? Didn’t known they have gutters though. I’ll check them out and see if I like them. Thank you!!! I wear a Saucony Visor (check them out), it keeps both sun and sweat out of my eyes as they have a sweat band built into them. Check them out.